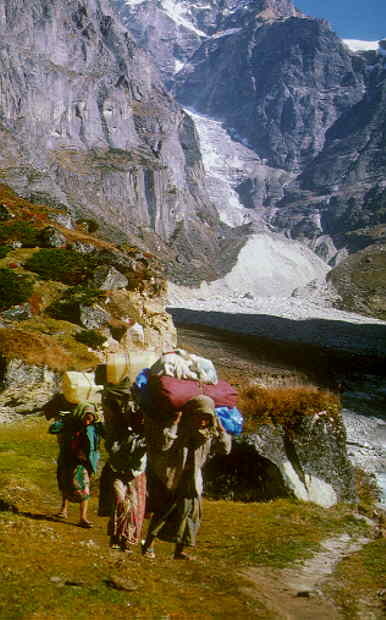 Female porters of the Tamang tribe on their way back from Tangnag to Lukla. 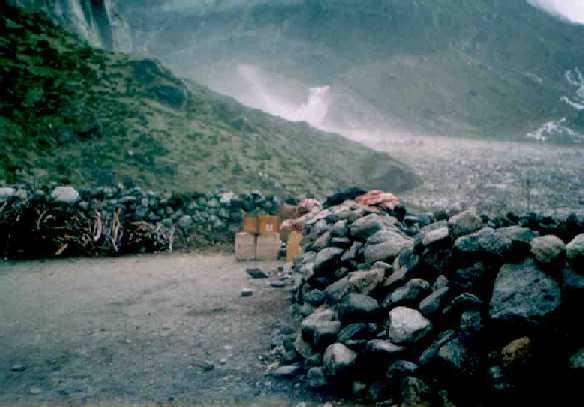 Background the Sabai Tsho Glacier and the broken moraine dam. 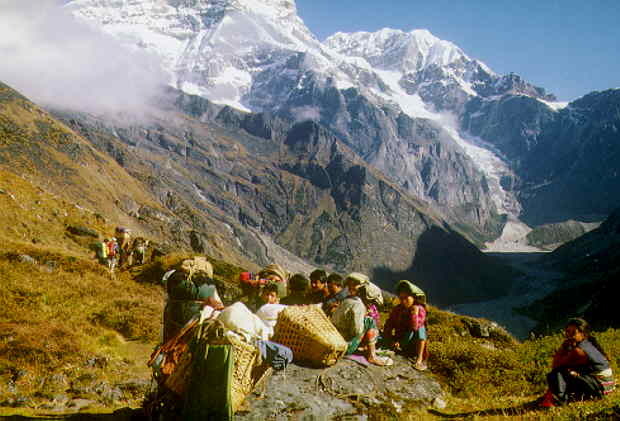 A natural disaster hits the village of Tangnag, 20 km SSE of Mount Everest and downstream villages along the Hinku Drangkha and Dudh Kosi Rivers Sabai Tsho Lake before the moraine dam breach. Around 6 AM in the early morning of September 3rd, 1998, Lhakpa Geljen Sherpa and his wife living in the remote mountain village of Tangnag in Eastern Nepal woke up from tremors of an earth quake. They are used to earth quakes but this one was strong. The village of Tangnag lies at 4356 m altitude in the Hinku Valley, 20 km SSE of Mount Everest and is surrounded by several, over 6000 meters high mountains and numerous glaciers. They heard a load splash from the nearby Sabai Tsho Lake and rushed outside. Instead of the normal trickling stream, a large waterfall came down the glacial lake moraine dam. All the villagers quickly moved too higher grounds for safety. After two hours the dam collapsed followed by a load roar of released water. 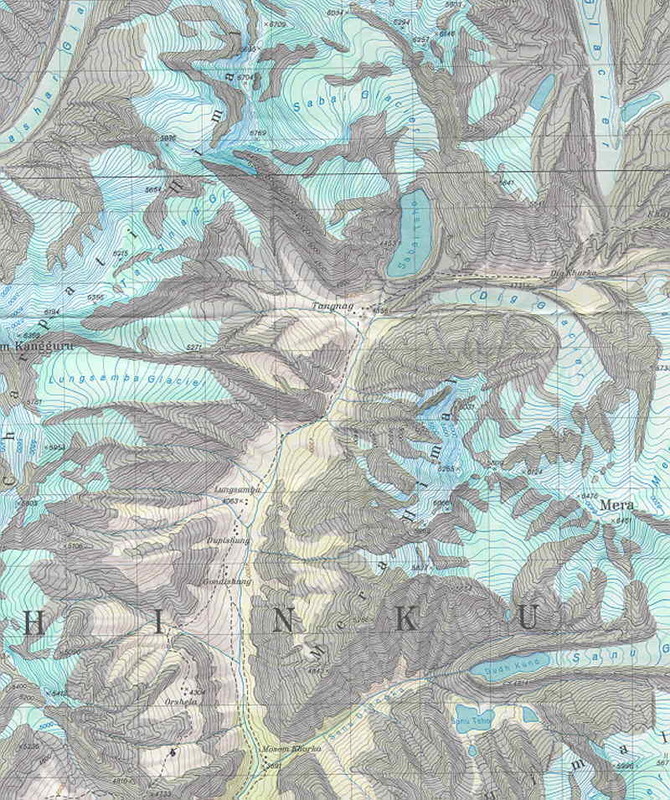 A flood of water, rocks and glacial ice passed along the main stream valley. This lasted for only 5 to 10 minutes. 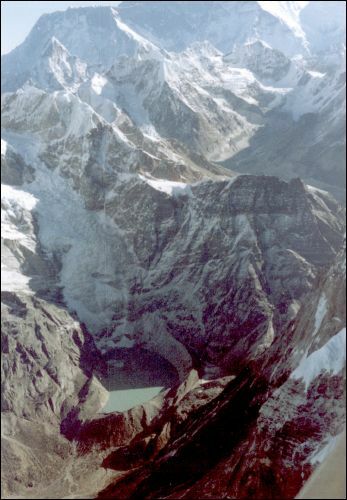 The 100 meter high moraine dam of the Sabai Tsho Lake had a gaping hole some 300 meters wide. You are visitor # since 23 February, 1998.